Stephanie Fowler, the host of Oregon Public Broadcasting’s “Seven Days,” has an out-of-step attitude these days on moderating a current events or public affairs show. “I like to have an ear for what is not said. The space between the sentences leads you deeper to a person. Because what’s not there is just as important as what is there, and that’s true in layout, in news stories, at news conferences; absences are just as important. I listen for different levels of discourse. I tune out the loudest, and attune my ear to other tones.” What modern day TV moderator talks like this? a successful family counselor—that’s an unusual second occupation for a television journalist. Chris Matthews, the host of MSNBC’s “Hardball,” who is frequently lampooned on NBC’s “Saturday Night Live” (SNL) for his shouting, doesn’t talk like Fowler (Fowler describes Matthews as too pugilistic). FOX News star Bill O’Reilly, who once anchored Portland’s KATU News in the early 1980s, doesn’t talk like Fowler (Fowler on O’Reilly: “It’s all about Bill. I’m the exact opposite in every way). And KXL’s Lars Larson, who on Labor Day launched his new national radio show on Westwood One radio network doesn’t talk like Fowler (Larson is one of only three guests on “Seven Days” in its seven year history not invited back. “He had his own agenda and took the conversation way off course to get there,” says Fowler). Matthews, O’Reilly, and Larson, all successful, all male, all stars, and all talk show hosts comfortable with the large ego it takes to get a show to that level, and all three not worried in the least about the absences of what’s not said, the tones, and the quieter levels of discourse, the meaning behind the words. But that’s not Stephanie Fowler’s style at all. She is not a big fan of the star system. For nine years as the host of Oregon’s only public affairs program, Stephanie Fowler has delivered an understated but quietly powerful political discussion show. And she’s done it for not a lot of money. Says Jack Galmiche, OPB’s Chief Operating Officer, “it costs around $200,000, maybe a little less than that, to produce.” “Seven Days,” “Oregon Art Beat” and “Oregon Field Guide” are OPB’s only local shows; the rest of the programming is national. All three shows are popular and have considerable audiences. “Oregon Art Beat” and “Oregon Field Guide” have local corporate underwriters. “Seven Days” does not. And now that the legislature is cutting the ten percent of OPB’s budget that it annually contributes, Oregon’s only public affairs show is about to go dark. As word leaks out that “Seven Days” may be cancelled, the response to save the show hasn’t yet amounted to an outcry, or uprising. More than a decade ago, in response to a shrinking national audience for serious television news, a national magazine ran the headline “Is ‘MacNeil-Lehrer’ Too Good for Us?” A headline like that all by itself might be a show’s death, reminding readers of H.L. Mencken’s advice that nobody ever went broke underestimating the intelligence of the American public. But consider for a second that Oregon and America in ’03 are very different places than in the boom decade of the ‘90s. In the new, more serious decade, and with more serious threats, does the public’s attention come back to public affairs shows? Is Hering right? Are people more disengaged than before the Nasdaq bubble burst and before September 11th? The question was put roughly to OPB’s Galmiche when asked about the size of the “Seven Days” audience. Not a bad audience for a show with no corporate sponsor. So how has the understated, swimming-against-the-tide moderator, Stephanie Fowler, built such a quietly powerful and loyal audience over the last seven years? Fowler answers by sticking to her life’s premise. “I’m just a middle-aged lady with some expertise in public affairs trying to help people understand what is going in this part of the world. It’s about the content.” Having “some expertise in public affairs” is a typical Fowler understatement. Fowler’s had a lot of firsts in her time. After doing feature reporting for KGW, which she didn’t enjoy, Fowler joined KOIN to cover the legislature. She says the change in assignments was like going from “junk food to steak.” A few years later, Fowler earned another first when the Oregonian’s editorial page editor Robert Landauer hired her as the first woman on the paper’s editorial page. Fowler took the duties, as usual, seriously. In the mid ’90s Fowler became the first ex-sports anchor, ex-TV political reporter, ex-editorial page writer to enroll for a masters degree in counseling at Lewis and Clark College. Today, Fowler is a licensed counselor in Northwest Portland. Is she any good? “They say I’m good,” says Fowler. There are a couple of reasons that the audience for “Seven Days” is as solid as it is, and they have to do with Stephanie Fowler’s approach and growth as a moderator—a job that can look easy, but is deceptively difficult. Conservative columnist Reinhard agrees with Kane and Lavey, “Fowler makes an effort to make the show balanced, but it’s hard because of the way the media is in this state.” When Reinhard says, “the way the media is in this state,” he means liberal. Fowler is aware of the problem and it’s one of the reasons she’s built trust as a moderator, especially with Oregon’s business and civic leaders. Whether it’s the media or whether it’s the people who have migrated to Oregon in the last decade and a half, Oregon, and especially Multnomah County, have developed a liberal culture (and something of a national reputation) which these days some are calling more provincial than progressive. Fowler comments on what seems to many to be an Oregon disease. The incident that got the reporter from the Skanner banned occurred in an exchange with Hasso Hering. “I think there were some punches thrown,” laughs Fowler, implying it was a little too wild for her tastes. 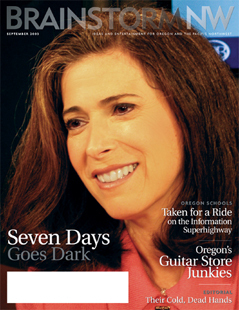 And Fowler, like a lot of Oregonians, sees more need for a public affairs show now than in the previous decade. For moderator Stephanie Fowler, a person who has made a career out of listening, of finding the meaning in the silences, in the absences of things not said, the absence of “Seven Days” from OPB’s lineup next month would be a sour irony. And it would also leave a powerful audience wanting.